What’s it like behind the gates of the greatest horse farms and ranches in America? Doug Prather knows. 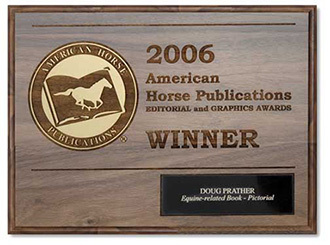 As an internationally renowned equine photographer, Prather has been granted access to the intriguing world that lies within—the horses, people, and private places that are rarely viewed by the public eye. For the first time, Prather makes it possible to catch an insider’s glimpse of life on some of America’s most exclusive horse farms and ranches. Readers will be captivated by breathtaking images of horses grazing in hidden, dew-drenched fields, stallions racing in private paddocks, and foals frolicking beside watchful mothers in secluded golden pastures. Through Prather’s lens, horse lovers will experience the serenity of misty mountain views and quiet morning turnouts, as well as the excitement of cutting horses working cattle, and the thrill of Thoroughbreds thundering down world-class training tracks. 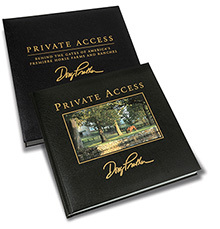 Private Access is a table top book of fine art, beautifully bound in a 12” x 12" hard cover presentation. 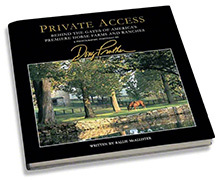 Hundreds of Doug Prather’s original photographs showcase sixteen of America’s most beautiful and successful horse farms and ranches. Featured farms of the Kentucky Bluegrass include Gainesway Farm, Calumet Farm, Airdrie Stud, Coolmore/Ashford Stud, Hill ‘n Dale Farm, and WinStar Farm. In Texas, the Four Sixes Ranch and the Pitchfork Ranch are highlighted. In Virginia, historic Rokeby Stables and Newstead Farm are the farms photographed. Florida farms include Live Oak Stud, Padua Farm and Roberts Quarter Horses. Featured California farms include Magali Farm, Tommy Town Thoroughbreds, and The Alisal Ranch. Private Access is written by nationally syndicated columnist and author Rallie McAllister, M.D. She is a gifted equestrian and former horse trainer whose articles regularly appear in leading equine publications. Join McAllister as she takes you on an intriguing written journey behind these gates of America’s premiere horse farms and ranches. Private Access is an artistic creation that will appeal not only to horse enthusiasts, but also to every individual with an appreciation for the beauty of nature and its creations. 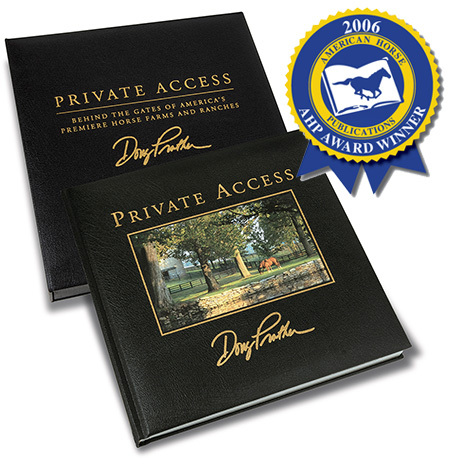 The book is a collectible treasure that will be cherished for its artistry and its historical value, as well as for the secret passageway it provides to America’s premiere horse farms and ranches. Signed and Numbered Limited Edition of only 350 Books. Book Size 12" x 12". 252 color art pages enhanced with a gloss varnish. Each edition comes in it's own custom hard cover leather folio case. Gold foil stamped front and hand inlayed cover image. Hard Bound Book Size 12" x 12". 252 color art pages enhanced with a gloss varnish.